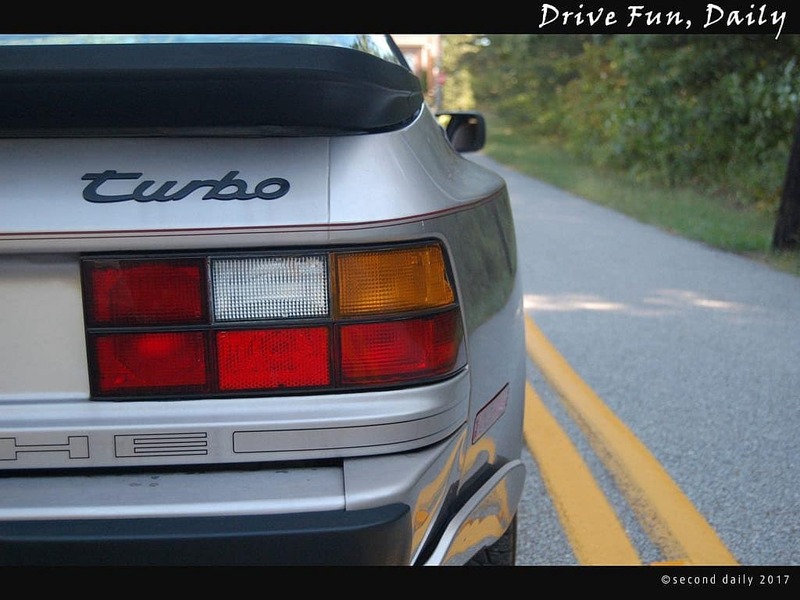 Porsche 944 turbo – daily fun? If you haven’t seen Sixteen Candles you should stop reading this immediately, get up from your desk, and tell your boss you need the rest of the day off. 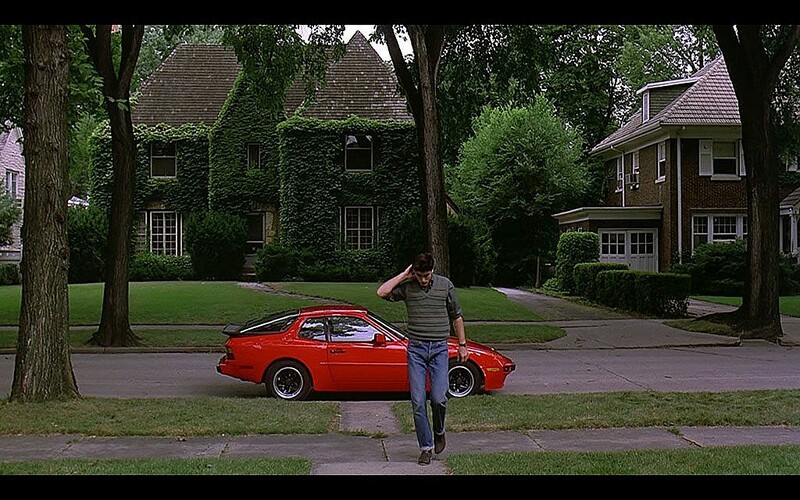 Few would argue the significance that closing scene brought to the Porsche brand…Jake Ryan was cool but that Guards Red 944 he was leaning against is what gave him that status. After watching it though, be sure to come back. The first time the public saw the 944 was actually in 1981 at Le Mans, two year prior to its production launch in 1983. Ironically it was turbocharged but it wasn’t until 1986 that it was made available for public consumption. Best known internally and with enthusiasts as the 951, the 944 turbo would forever change the Porsche lineup and give pause to the executives on exactly how to keep so-called “entry-level Porsches” from stealing the lime light of its bigger brethren (the 911 and 928). A near perfect 50/50 weight distribution and acceleration matching some of the top supercars of the time gave Porsche enthusiasts something to be happy about for a long time…unless of course you ask die-hard 911 fans who will still to this day shun anything with an engine other than in the rear. Ok ok, but you have to admit…the 951 is a lot of fun to drive! 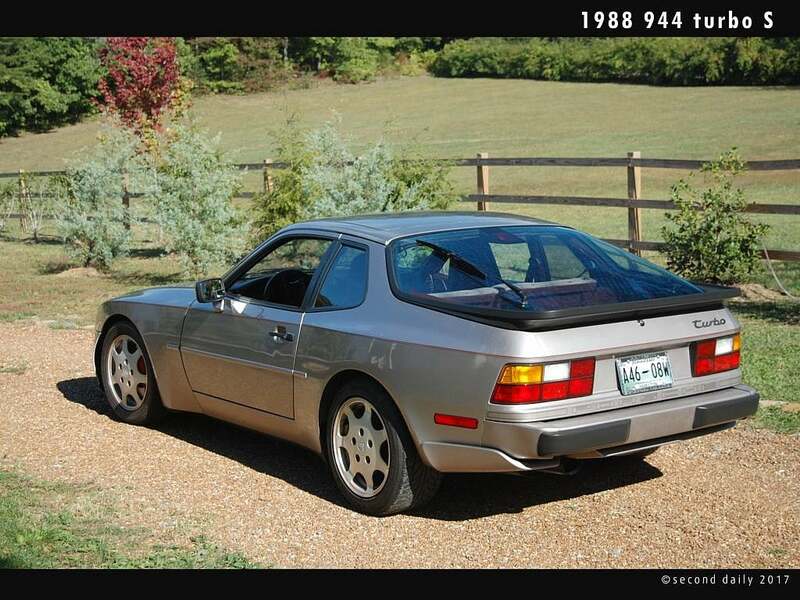 The 951 wasn’t simply a 944 with a bolt on turbocharger and cool deck lid script badge. Exterior modifications, interior changes, suspension, engine mods…many parts were created new for the 951. One of our favorite ads of all times, across any brands and time span, is the one below…showing that it takes much more than turbocharger to turbocharge a 944. Part of the huge success that came to the 951 was because of the performance you got with a very agreeable price tag…coming in at about $30000, the 944 turbo was priced $20000 less than a 911 turbo or the 928S. It was also the first car sold in the USA with a passenger-side airbag as standard equipment. The first 400 or so that made it to the states actually didn’t have the 3rd brake light in the rear glass…so there’s a unicorn for you to chase. The real unicorn though is the special edition turbo S model produced only in 1988. 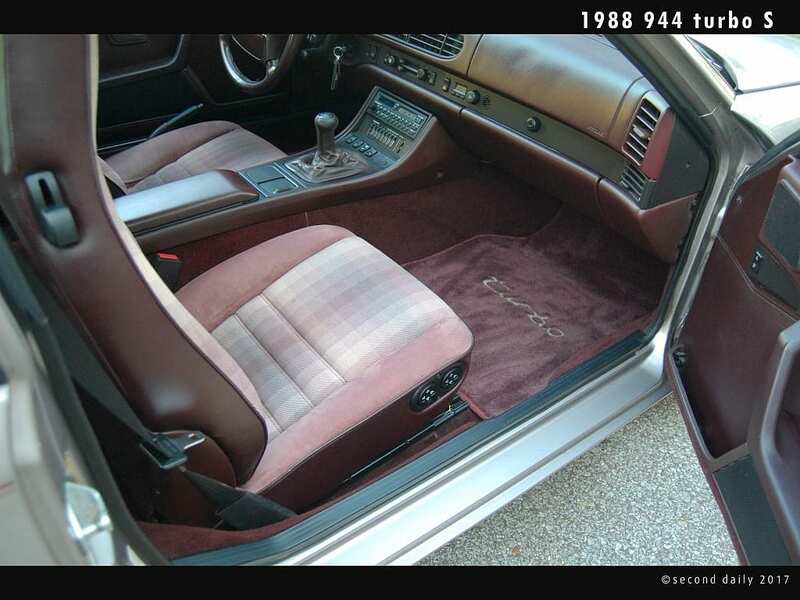 Only 1635 were made during the one year run, with the initial run being a special Silver Rose exterior with Studio Plaid cloth interior (yes, you read that right)…1000 of those were made and that was to be all, but an additional 635 in various colors were produced to satisfy some loyal customers. 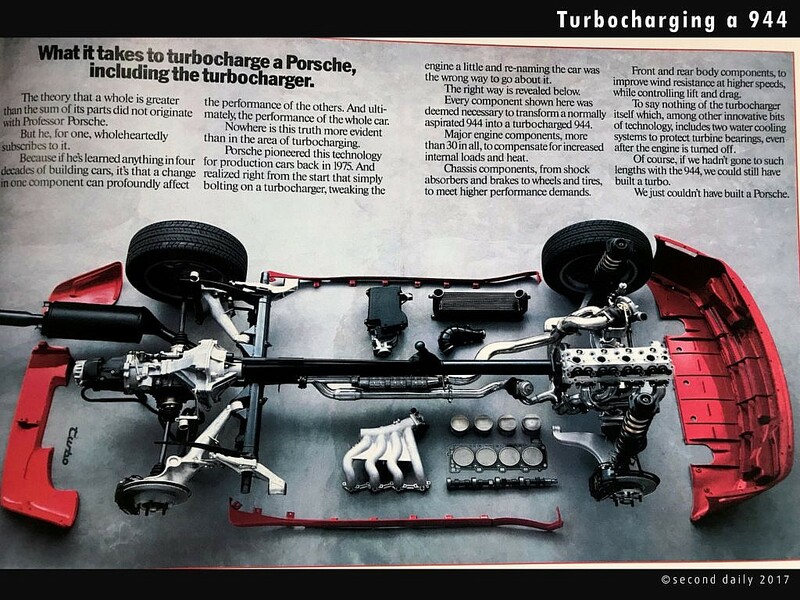 The turbo S was based on the Turbo Cup model…but given enhancements over the regular turbo including a BHP bump to 250 from a larger turbo and boost psi, upgraded Brembo 4-piston calipers borrowed from the 928 S4, suspension upgrades, a LSD, and a few other unique turbo S features. At the time, it was one of the top 5 fastest production cars on the market…only the Porsche 928 S4, Lamborghini Countach, and Ferrari’s GTO & Testarossa were quicker. The ’89 model year assumed all of these enhancements but isn’t considered as collectible as the turbo S.
So how is it as a daily? Very good…gas mileage from the 4-cyl turbo is an astonishing 25+mpg even in cars with high-mileage. Most of these cars have well over 100k miles making them great drivers with no guilt. RWD may limit some as year round drivers, but the rear transaxle keeps weight on the tires for excellent traction and handling. Parts are very easy to come by (generally speaking, a few not so much) and overall very well German engineered…and forum help is a plenty (rennlist.com, pelicanparts.com, and clarks garage). They do sit low obviously, so seeing around the Canyoneros of today’s world can be a bit difficult sometimes. The cruise at highway speeds with no problems, in-cabin sound is low, though steering can feel a little light at higher speeds if components are worn. Most are equipped with A/C, cruise control and sunroofs…OEM stereo equipment is for the birds so open the windows and let those 80’s flybacks fly. What to look for when buying? Maintenance history! Timing belts are good for about 3 years or 30k miles. So if you’re buying and the seller doesn’t know when it was done…tow it directly to the shop and have it replaced. Also be sure the fuel lines are wrapped with the proper material or replaced with SS lines. Many of these cars have been lost to fire due to the fuel line placement. Look for improper tire wear, modifications to the boost psi, any exhaust mods. Does the seller have the original wheels, tool kit, tonneau cover, owner’s manual? All of these things indicate how well the car has been treated. Clutches are usually good for about 75k miles. Because of the low cost to entry, tunable engines and the wealth of internet help, most of these cars have been lost to the track or heavily modified by now. So be patient and look for one that is mostly original. Not saying you have to keep that way, but better to know what’s in it if you do it yourself. Values of the 944 turbo have steadily increased over the last few years, with the turbo S commanding sometimes 100%+ premium over a similar ‘regular’ 951. Expect to pay no less than $10k for a base 951 and $15k+ for a decent turbo S in today’s market. 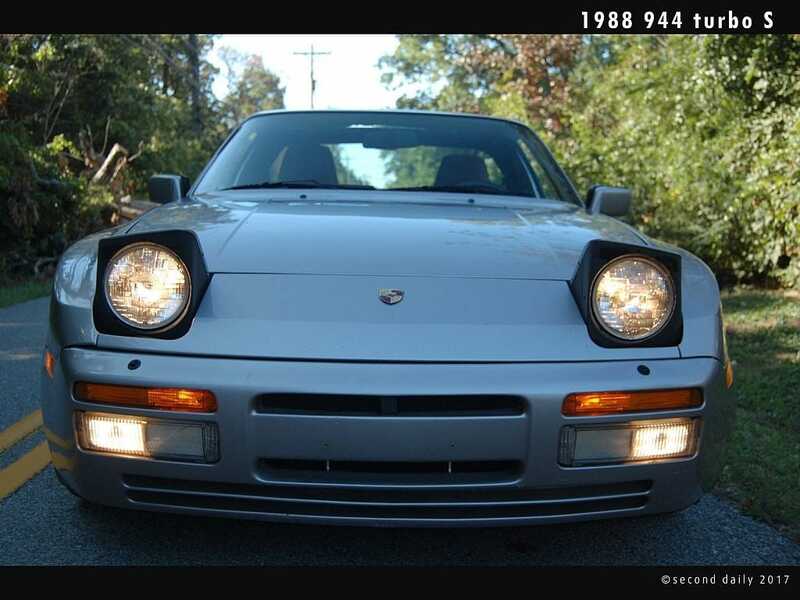 This entry was posted in German Classics and tagged 911, 928, 944, porsche, turbo.